Vincent van Gogh—known more for his visual not verbal communication; however, in his endeavor to be a great artist, Van Gogh recognized a great life truth. 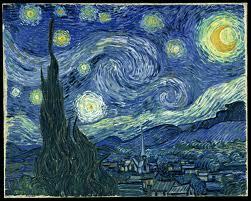 Van Gogh recognized that, although he was a gifted artist, even his life would not be without some hardship and pain. He indicated the need for courage and taking heart. Scripture talks repeatedly about taking heart. One of the greatest examples is the apostles Paul’s journey to Rome in Acts 27. Paul had been nearly beaten (Acts 22:22-29); wrongfully accused; unjustly tried before councils (Acts 22:30-23:11), governors (Acts 24), and kings (Acts 25-26); and was heading to plead his case before the emperor of Rome. He entered a ship, under arrest by the Roman government, and went through a terrible sea storm that left all on board abandoning any hope of being saved (Acts 27:20). How often is that our attitude through the storms of life? Just when things seem like they cannot get any tougher, we lose another loved one, or find out about another expense we were not expecting, or realize those friends thought to be loyal to the end have bailed on us. It is in those moments where we, like those on board with Paul, are tempted to lose all hope. But that is not what the apostle Paul does, nor is that his attitude. Here stands a man, on trial for crimes he did not commit, facing punishment he does not deserve, enduring hardships he should not have faced, and yet what does he say to those around him? TAKE HEART! Acts 27:22 and 25 both record Paul telling the others on the ship to TAKE HEART! Talk about a kick in the pants! Paul hit his fellow shipmates right between the eyes. Ironically, Paul was not just readjusting their circumstantial perspective; he was helping them align their eternal perspective as well. Verse 25 says, “TAKE HEART, men, for I have faith in God that it will be exactly as I have been told“. Paul was not being a “think positive thoughts” guru. He founded his hope and courage in what God has said. Paul TOOK HEART because he trusted the Word of God for what it was: perfect, sure, right, pure, clean, true, and righteous altogether (Psalm 19:7-11)! But Paul is not the only one to give us hope based on God’s Word. Someone even greater did so a few decades earlier. THE WORD OF GOD told His disciples hours before His death the same thing in John 16:33—TAKE HEART! In this instance, the ultimate reason for TAKING HEART was given. That reason was the person and work of Jesus Christ. It was through His sacrificial, substitutionary, atoning death and resurrection that He would ultimately overcome the world in the future…and not only that, but He would give all of His disciples the assurance that the world and all its heartaches (financial struggles, relationship issues, sickness, cancer, death, etc.) were already overcome. So while Van Gogh was on to something in stating: “It is necessary to TAKE HEART“, it is not until we understand the cross of Calvary, the Savior who died there, and the Good News that was proclaimed there, that we can TAKE HEART this side of heaven!